This is a repost of a blog I wrote last week for the Yosemite Romance Writers Blog. How do you measure up? I’d love it if you’d comment! School’s been back in session over a month for most teachers and students by now. Yesterday, during a family party, my third grade grand-daughter asked her aunt to quiz her on math facts. I think she likes school! I was pleasantly surprised how quickly she answered most of the questions, even the ones I thought were too hard for her. A couple of weeks ago I had to give Stud Muffin a remedial course in the hallway linen closet. Me (while doing my Vanna White impersonation): See the labels on these shelves? Guest. And Cleaning. All the towels and rags on the cleaning shelf are free for you to use to wash the car, bathe the dog, or anything else you want. All the towels on the guest shelf are not to be used for cleaning. They are for use in the guest bathroom. Only. Stud Muffin: How long have those labels been there? Anyway, that experience combined with Evelyn’s request for a quick check up made me think about other things in life that need occasional review and maybe remediation. Like my writing goals. So, I’ve done a quick gut check and given myself the following grades. Business building: B. I have several steady editing clients and a great work-for-hire company that uses me. I’d like to have a few more income generating jobs, but overall, I’m happy. Actual writing: C. Some days I get lots done, other days I don’t even sit at the computer. I try to average 1000 words a day on my WIP, though it’s actually closer to 400. But when I factor in other writing (such as blog posts! ), I’m close to my goal. There’s lots of room for improvement though. Submissions: D. I checked the spreadsheet that I use to track submissions. I’ve entered two contests this year (nothing except feedback for one, the other is still being judged) and one submission to Woman’s World magazine. Nothing to publishers, editors, or agents. So time to get off my cushy office chair and put something out there. I have 50 pages almost polished enough to send to the agent I’ve been courting. Networking: B. I joined RWA and YRW. I belong to Sisters in Crime. I’ll be going to a long weekend workshop in November. I maintain a nominal Twitter presence and an active Facebook page. To improve, I plan to spend more time using Goodreads to a fuller potential. Platform Building: B. I surf some industry blogs and try to chime in with non-annoying comments when appropriate.I blog myself at least twice a week, often more. I’m sure there are other areas I should be evaluating, too. What are some of your grades? And what areas do you evaluate? I’m so excited to share a great contest giveaway with you. I’ve known Katie for … ummm … a lot of years now. She writes wonderful stories and Chasing Hope is her best yet. I hope you’ll take a minute to read about the book and click through to enter the giveaway. How cool would it be for one of my readers to win one of these awesome prizes?!?! Good luck! In author Kathryn Cushman’s newest novel, Chasing Hope, Sabrina Rice is a gifted runner and Olympic hopeful who’s had her dreams shattered by a devastating diagnosis. One forfeited scholarship and several years later, she’s focused on building new dreams. Dreams that have nothing to do with running. This giveaway starts September 16, 2013 and ends October 3, 2013 @ 11:59 pm (PST). Winners will be selected Friday, October 4, 2013, and announced at KatieCushman.com. I loved the first book in the Apple Creek Dreams Series, A Quilt For Jenna. I opened The Road Home with a bit of trepidation, hoping it would be as good. Rest assured, Patrick Craig is a gifted novelist and he writes a page-turner. I enjoyed catching up with Jerusha, Reuben, and Jenny. We got just enough of the backstory from the first book so a new reader knows what’s going on, but not so much that it bogged down the new story. When we left the Springer family, they had just welcomed four-year old Jenny into their family. The Road Home opens in 1965. Jenny has grown into a lovely young woman, but she is plagued by feelings of not fitting in in her Amish family and community. She loves her adoptive parents, but yearns to know who she is and where she came from. Johnny’s story begins in San Francisco, in the midst of the drug and free love culture. He witnesses a crime and flees the city with drug dealers on his tail. He spends a few days in Apple Creek and meets Jenny. The two are drawn together by a shared sense of something missing. When the drug dealers find Johnny and Jenny, their lives are in great danger. Only by God’s grace do they get away and get answers to all their questions. I’m looking forward to the next installment from Patrick Craig, Jenny’s Choice. I’m intrigued and wondering what her choice is all about. The Road Home is a recommended read! 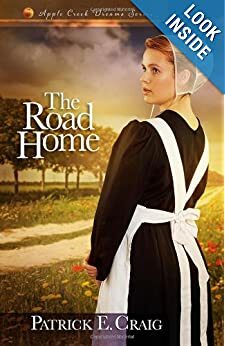 –I received a free copy of The Road Home from Mr. Craig and Harvest House in return for an honest review. Woe! It’s Wednesday: Which Came First? Was this heart of gold an actual gold mine or was it a metaphor for something else? Was he singing about searching for a heart of gold in someone who’d hurt him? The song “Heart of Gold” was released in 1972, a few months before I officially became a teenager. At 13, who takes a song at anything other than face value? My musical loves were Donny Osmond and the Partridge Family, so clearly deep lyrics were not my thing. Interestingly enough, Donny’s “Puppy Love” was also a 1972 hit. Anyway, last week I suddenly heard a deeper meaning in the words and looked up the lyrics to see the whole song in context. Since I’m sensitive to copyright issues, I don’t want to reprint the lyrics here, but if you’ve got another minute, I encourage you to do a quick search and read them yourself. They seem to refer to a search for a deeper meaning and focus of life. Does that mean I should stop searching for a “heart of gold” in a narcissist? I think it means I can stop trying to convince myself that someone who is consistently selfish and self-centered can change. Even if they can change, they don’t want to. I can drive myself to keep searching for their heart of gold, but eventually I will have to concede that it doesn’t exist. That doesn’t mean I won’t believe the best about someone and their intentions. It does mean that when someone consistently makes everything about them, the healthy thing to do may be to stop searching for their heart of gold and just accept them as they are. It’s no secret I’m a huge Kathryn Cushman fan. Which means I also have high expectations for her novels. Chasing Hope exceeded those expectations. Sabrina was an Olympic-calibre runner whose career was cut short by a medical condition. She immediately changed focus and poured all her energies into her college major, determined to succeed at her new goal. Brandy is an at-risk teenager trying to outrun her past and stay out of juvie. Sabrina’s grandmother convinces her to coach Brandy. Sabrina reluctantly agrees, never dreaming how her life will change in the weeks ahead. Cushman does a great job giving two sides to an issue. Chasing Hope gives us both characters’ perspectives on their own athletic abilities. Sabrina loved running and misses it so much that she avoids even watching college sports because it’s a stabbing reminder of what she’s lost. Brandy sees running as her ticket out of juvie and that’s about it. They each grow to see that running is both more and less than an athletic endeavor. As Sabrina struggles to finish her senior year of college with additional medical challenges, she takes the reader along her journey. We travel out of Egypt with Sabrina and the ancient Israelites. We cross the Red Sea on dry land. We thirst for God. I found myself holding my breath and flexing my legs during the running scenes and thirsty while Sabrina mused about three days without water. Another reviewer commented that Chasing Hope didn’t contain anything explicitly Christian that made it a Christian book. I disagree. I found faith woven throughout the book but so skillfully done that someone who says they “never read Christian fiction” could be converted to loving Inspirational novels. Chasing Hope wins the gold! I loved it and highly recommend it. **I received a copy from the publisher in exchange for an honest review. Done and done.